The day that I camped I was so excited and I felt like I wanted to scream with happiness it was such an amazing experience. When I entered Birkheads Wild I was so surprised that it was not just a big forest and it was a lovely planned out field with tents, trees, a fire ,toilet and a parachute it looked fantastic. What we did when we got there!!! The first thing we did was make our beds in the tents what where provided. 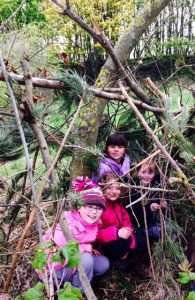 Next, we made a lovely den with sticks and twigs then got our teacher to sit inside, after we got a water gun to see if the dens were water proof and the wild kids won. The next thing I did was make a bracelet out of nettle. We also toasted marshmallows then put 2 digestive biscuits between the marshmallows. Things I would advise you to bring !!! Kit list: A sleeping bag. Clothing. Roll mat. Spare socks.Water proof gear. Cap/sun protection. Bug protection. Midnight snack. Pillow.